We’re offerring a piece by our retired teacher comrade Jack Gerson on the “legacy” of Tony Smith, the now resigned superintendent of the Oakland Unified School District. We will be posting more on this soon. Please send comments and suggestions. Tony Smith, laying the law down on Oakland’s students, teachers, and community . . . and then cutting out! Deuces! given the importance of the struggle in Chicago. My guess is that Tony Smith’s job in Chicago will be to break or weaken the powerful alliance between teachers, students, parents and community so evident during and after last September’s teacher strike. There are few who can match him when it comes to talking about the importance of neighborhood schools providing wraparound services to combat the effects of poverty; to recruiting, rewarding, and retaining good teachers; to stimulate authentic learning based on concepts and creativity rather than skill-based rote learning; to provide all the resources that teachers need to teach and students need to learn; to acknowledge and work to overcome racism and its effects; to forge real authentic collaboration between faculty, staff, community, students, parents, and administration; to crack down on mismanagement, excess administrative overhead, and needless outsourcing; etc. For that is exactly what he did when he was appointed superintendent in Oakland four years ago. He talked so well, in fact, that even some skeptics were willing to suspend disbelief and give him a shot. But in Oakland, it was just talk. Indeed, throughout his career, Smith has been a proponent of the corporate agenda for education and a practitioner of divide and conquer, of charter schools and privatization, of school closures, downsizing, and union busting. Smith takes funding cuts for granted; he goes hat in hand to his corporate patrons to solicit marginal funding (in exchange for carrying out their policies), but does not go after corporate and individual wealth. So in the end, he is just another proponent of “do more with less” austerity sacrifice. He executes the cuts demanded by his corporate patrons. This goes back to his roots. Tony Smith graduated from U. of California Berkeley in 1992, where he was captain of the football team. He went on to get masters and doctoral degrees in education from UC Berkeley, and from 1997 to 2004 was one of the leaders of the Oakland-based Bay Area Coalition of Equitable Schools (BAYCES – now the National Equity Project). At the time, BAYCES was the Oakland conduit for Gates Foundation money, and Gates was heavily promoting the “small school miracle”, engineering the breakup of thousands of comprehensive secondary schools nationally. In Oakland, starting in about 2001, BAYCES “designed” the breakup of three of the city’s six comprehensive high schools – the three “lowest-achieving” schools, those serving the city’s highest poverty areas, with overwhelmingly black and Latino enrollments – Fremont, Castlemont, and McClymonds High Schools. I was a teacher at Castlemont, which was broken into three small schools in 2003. BAYCES “redesign” included permanently closing the school’s library and consolidating the librarian’s position; eliminating French and eliminating the French teacher position; closing all three vocational academies (construction, culinary, and fashion), although all three provided job training in an area of sky-high unemployment for blacks and Latinos under 25 years of age. We said at the time that this under-resourced breakup of Fremont, Castlemont, and McClymonds would drive out students and teachers, encourage the growth of charter schools, and make already unstable neighborhoods still more unstable. And that is what happened: Castlemont’s enrollment went from 1,750 in 2003 to fewer than 600 last year. McClymonds went from 1,000 to 250; Fremont from 2,300 to 750. At the same time, charter school enrollment in Oakland quadrupled. In 2003, in the midst of the BAYCES-led breakup of Oakland secondary schools, the state of California put OUSD in receivership, ostensibly because the district’s budget was $37 million in the red. For the first two years of the state takeover, BAYCES openly co-administered OUSD with Elli Broad’s handpicked State Administrator for OUSD, Randy Ward, and an army of other Broad Institute graduates. During this period, scores of custodians, nearly all maintenance workers and many food service workers and drivers were laid off; libraries in nearly every middle school and several high schools were closed; charter school enrollment soared. Randy Ward introduced Results Based Budgeting (RBB), in which school sites were told that they were responsible for nearly all expenses, including teacher salaries – pressuring principals to try to force out veteran teachers in favor of lower-paid and untrained Teach for America recruits, and to cut supplies and resources to the bone (at more than one school, teachers were told that they needed to pay for copier paper out of their own pockets). Tony Smith was a BAYCES leader when these policies were put in place. He left BAYCES in 2004 – not in protest, but to advance his career. From 2004 to 2007 he ran the Emeryville, California schools. From there, he went to San Francisco for a year and a half as Deputy Superintendent. Fast forward to Spring 2012. Tony Smith has been OUSD superintendent for three years – ever since the state takeover ended in 2009. Despite his passionate and eloquent rhetoric, Smith has continued – even deepened – the harmful policies put in place during the state takeover. He has maintained Ward’s Results Based Budgeting and, like Ward, has used RBB to target veteran teachers. Now, in April 2012 Smith, who participated in the ill-conceived break-up of the three high schools while at BAYCES, announces that the position of classroom teacher will be abolished at Castlemont, Fremont, and McClymonds, where now all teachers will be “teachers on special assignment” and the small schools replaced by “Acceleration High Schools”. The reconsolidation was as ill-conceived and as poorly designed as the breakup had been: the libraries remained closed; custodial, food service and clerical staffing remained inadequate; support services were scarce; overall the schools remained terribly resource-starved. The elimination of the classroom teacher position was a transparent excuse for violating the due process and seniority provisions by forcing all teachers at the three high schools to reapply for their jobs every year. School size isn’t the primary determinant of success. BAYCES breakup of the comprehensive high schools a decade ago was destructive. Smith’s reconsolidation has been destructive too. And Smith has gone a step beyond to overt union busting, by forcing teachers at these three schools to reapply for their jobs every year. Neighborhood schools? Smith closed several, including five elementary schools last June (scaling to adjust for the difference in size between Chicago and Oakland public school enrollments, those five closures alone would be equivalent to the 54 schools Rahm Emanuel et al plan to close). When a group of parents, teachers, and community staged a 17-day sit-in at Lakeview Elementary to protest the closure of the five schools, Smith sent in the cops to evict us. Wraparound services? Two years ago Smith gutted Adult Education – from 25,000 students when he arrived in 2009, the program now has been all but wiped out. He made cuts to Early Childhood Education. He eliminated counselors at the district’s largest high school. Etc. Those few services he did introduce were partial, and based on soft money from his friends and patrons in the corporate foundations. Combating racism? All of the schools Smith closed last year were majority minority enrollment – four black, one Latino. Many of the schools in the black and Latino communities that remain open have become more segregated under Smith. Recruiting, rewarding, and retaining good teachers? Establishing collaborative relations? Oakland teachers have been without a contract since 2008, and are paid 20% below the state and county averages for public school teachers. In 2010, when negotiations broke down over Smith’s demand that the teachers union accept no pay increase, larger class size, weakened seniority and academic freedom, Smith imposed his terms on the union – the first Superintendent in OUSD history to do so. Union-busting then in 2010, just as he did two years later by forcing the Castlemont, Fremont, and McClymonds teachers to reapply for their jobs. Providing the resources teachers need to teach and students need to learn? Several Oakland elementary schools were chosen by the state to receive supplementary funding for class size reduction, resources, and support under the Quality Education Improvement Act (QEIA) funding, a program aimed at helping the state’s lowest-achieving schools. For the past two years, OUSD has lost millions in QEIA funding because all but one or two of the QEIA-eligible schools failed to meet class size targets – clearly not a problem of poor site administrators, but rather of an inept and unsupportive district administration. Cracking down on mismanagement, excess administrative overhead, and needless outsourcing? Relative to its size, OUSD under Smith has double the administrative overhead and double the outsourced contracts compared to the average California school district. 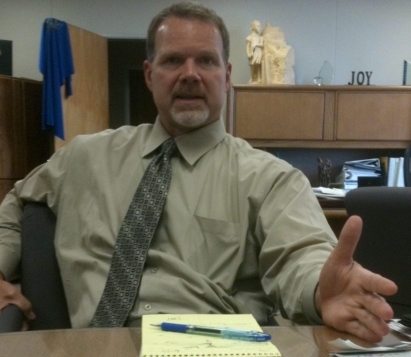 Last year, Tony Smith said he wouldn’t care if all Oakland schools were charter schools. Oakland already had the state’s highest percentage of students enrolled in charter schools, and that percentage has increased under Smith (from about 17% to about 20%). And when Tony enters the game, be prepared to ante up. Although Oakland teachers have not had a raise in five years and are among the lowest paid in the Bay Area, Smith demanded and got a 6% increase over his predecessor’s salary when he signed on as superintendent in 2009. Smith earns a base salary of $265,000 / year. His total annual compensation, including benefits, comes to more than $352,000. A thread runs through Tony Smith’s career: to attempt to counterpose, in practice, what he asserts to be the interests of students and community to those of teachers and staff. This aligns him with the corporate agenda. And, in fact, he is one of their rising superstars: witness the “philanthropic” funding to OUSD, cited in Smith’s resignation letter and in the school board’s accompanying statement. (This goes back at least to his BAYCES days [1997 – 2004], where he managed BAYCES connections with the Hewlett Foundation.). But smooth though his tongue may be, Tony Smith’s divide and conquer strategy was beginning to backfire on him in Oakland — witness the widespread, if passive, support from the community for the sit-in at Lakeview Elementary, or the increasing heat he has been taking at board meetings from community in west and east Oakland. So while Smith’s family health issues may well be real, I have to believe that he was looking to get out of town. And I have to believe that his corporate patrons want him in Chicago, where they think he’ll be able to win the community back to their side and break the teacher – community alliance. Prove them wrong. I hope the residents and community members in Chicago send Mr. Smith packing. He can not be trusted and he is not a man of his word. He had an avid campaign to rid OUSD of highly qualified minority administrators. All I have to say is Chicago, beware. Anyone, who was an employee of OUSD and forced to become an independent contractor doing the same job should contact the IRS and ask about a claim filed. This entry was posted on April 8, 2013 by ClassroomStruggle in Events & Actions, News & Analysis and tagged austerity, cut and run, OEA, ousd, tony smith.